These are the electrical feedthroughs I made from scratch for the vacuum system. 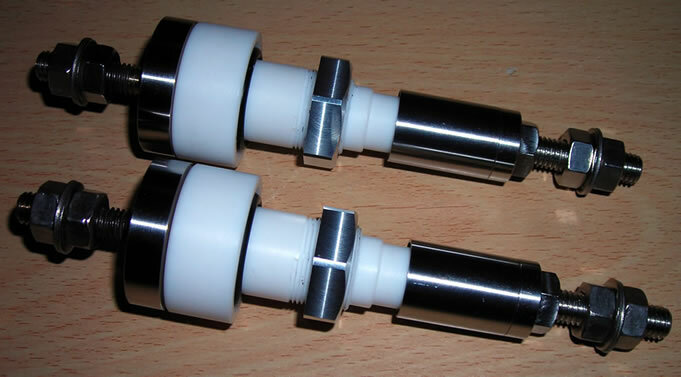 The insulator is PTFE (Teflon) which, although it is rather soft and has a tendency to cold-flow, seems to have low outgassing characteristics. The PTFE insulator is sealed with an O-ring on the outside of the chamber and is retained by an M20x1mm aluminium nut. The conductor (8mm stainless rod) is sealed with an 8mm ID O-ring pressed against the PTFE by the flange brazed to the 8mm rod. Shield nuts were made from stainless rod and tubing - this prevents any evaporated metal from shorting out the electrodes. All in all, a hell of a lot cheaper than buying them from Lesker for £160 each! The biggest cost was £40 for 1m of 35mm OD PTFE rod from Ebay.